The December Daily continues with Pages 11 through to 15 - thank you for letting me share. Just a quick reminder that the base of my December Daily is the Simple Stories line. I raided my stash for all other doo-dads which are all available in the Scrap Shotz store. I would love for you to hook me up to your December Daily. 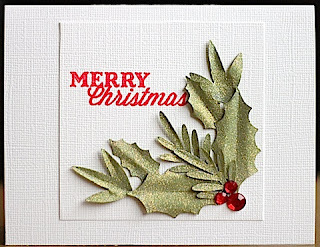 On behalf of Scrap Shotz, we wish all our loyal readers, forum members and friends a very Merry Christmas. May you be blessed with love and happiness from your friends and family. 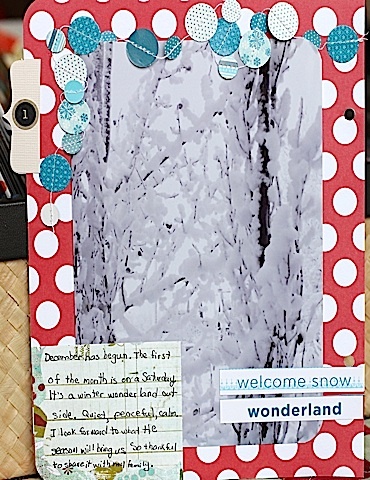 Look at this beautiful card created by Rosie. I find the image breathtaking. From Rosie..."I love getting out my embossing gun at Christmas time although I have not used it as much this year as I've fallen hard for Glitter Ritz ;)) and peel off stickers. If you're a kit subscriber the stamp set this stamp is from was one of your December kit add on choices and not surprisingly it is out of stock. Contact Sandy to find out if any more will be in stock. 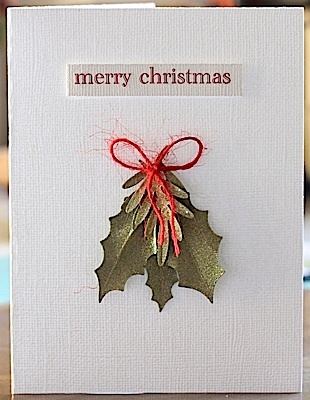 I kept this simple again, neutral coloured card stock and red embossing powder. Done in under 10 minutes!" Thank you for the inspiration Rosie! Dies, dies, dies...how many do you have? Do you find multiple ways to use your dies? 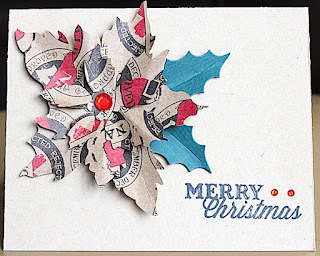 Today's inspiration shows a stunning card using a few dies, namely, Tim Holtz Tattered Poinsettia die and Dee's Distinctively Dies Wreath Builder die. Rosie used the Canvas Corp Naughty or Nice stamps on kraft paper, the Tim Holtz Tattered Poinsettia die, Dee's Distinctively Dies Wreath builder die and Want2Scrap red rhinestones. 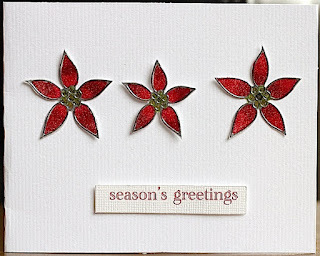 She cut the poinsettia using the Tim Holtz die and glimmer misted the pieces with Tattered Angels Chalkboard mist, Mr.Huey spray Blizzard, Shine and opaque white. Then the poinsettia layers were glued, starting with the largest to the smallest together and then allowed to dry. 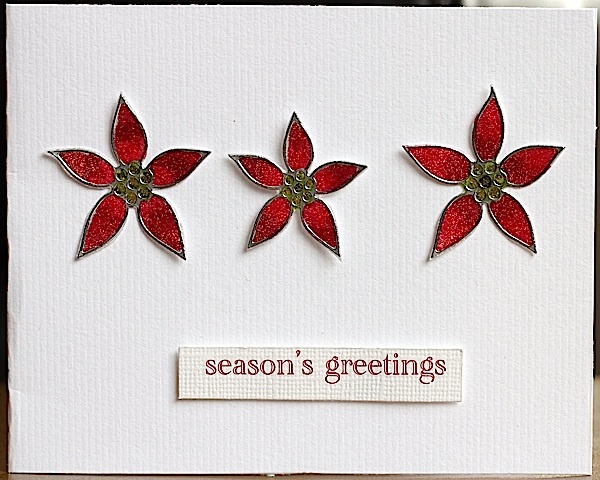 The poinsettia flower was then glued to the card base, adding wreath leaves under the flower. 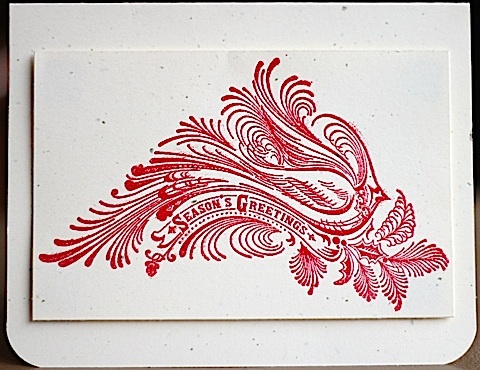 The sentiment was then stamped directly onto the card base. Gems were added as embellishments. I have found another classically beautiful, yet quick and easy to make. The card is displayed below. 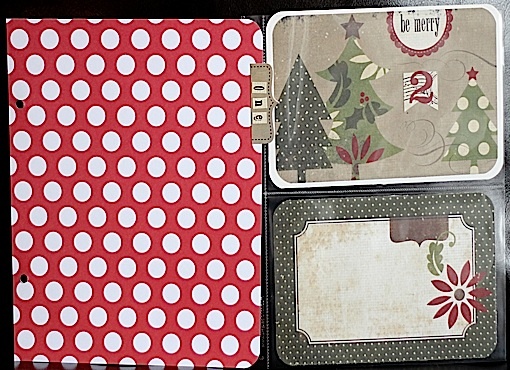 Rosie used the fantastic Elizabeth Craft Design peel off stickers available in the store. Sandy has a great selection and if you still have a few Christmas cards to whip up they go very quickly using these stickers. Rosie used the silver poinsettia peel offs and followed Carolyn Waldschmidt's great instructions in this blog post. The flowers were coloured with Copic markers R27 and R39 and YG06 is used as the flower centers. 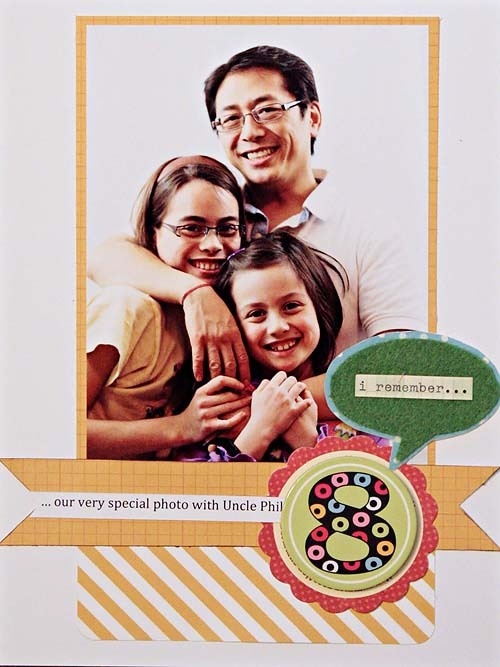 The sentiment is a Making Memories rub on from my stash and in no time you have a beautiful card!" 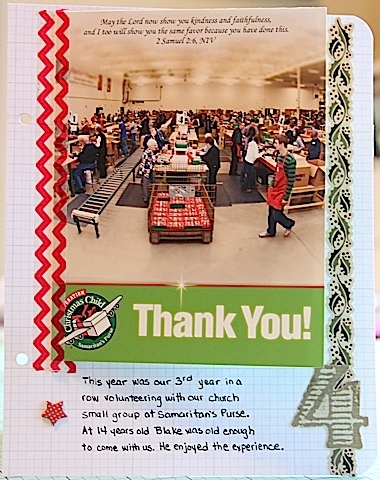 Another beautiful card which inspires us - thank you Rosie! 1, 2, 3...all done!!! Check out this fabulous card created by Rosie. It has a simple yet stunning design and is quick to complete. Rosie adhered the mask to the cardstock with some repositionable adhesive, inked with Tim Holtz Festive Berries distress ink, trimmed and matted on white card stock then adhered to the green card base. Then Rosie adhered strips of red card stock to mimic ribbon on a present and matted the stamped sentiment from my stash and adhered to the card front. 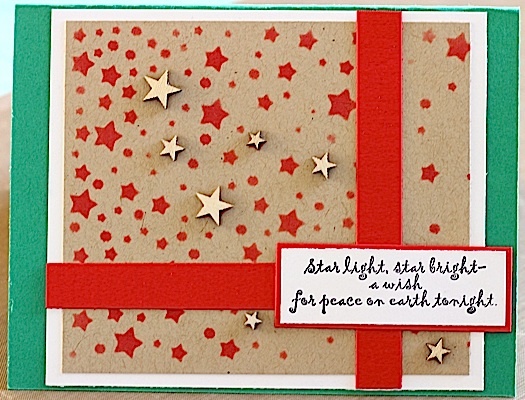 Lastly, she sprinkled Studio Calico wood stars from my stash on the inked background. Studio Calico Mistable Thickers can also be used are are available in the store. 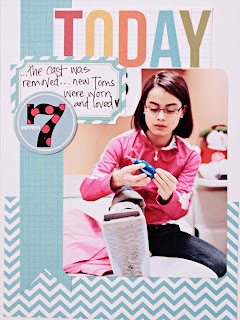 Look at this card which uses kraft cardstock, a stamp, pattern paper and scissors. From Rosie..."This is a super simple card to make using your favourite holiday sentiment stamp, kraft card stock and Naughty or Nice stamps on kraft paper by Canvas Corp, available in the store. 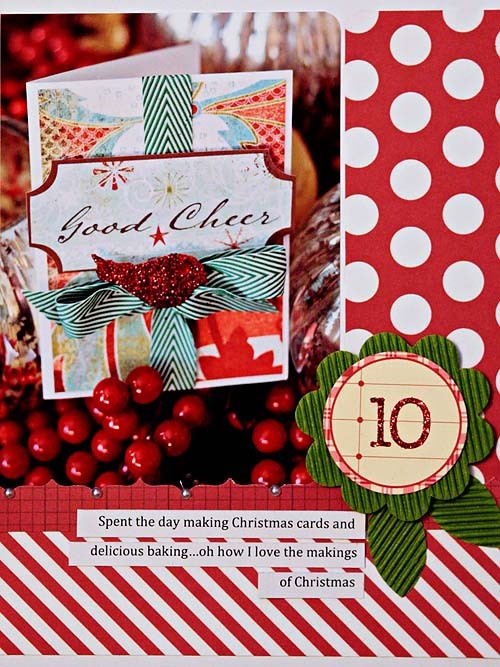 Trim desired circular elements from patterned paper. Adhere to kraft card stock front in desired pattern. 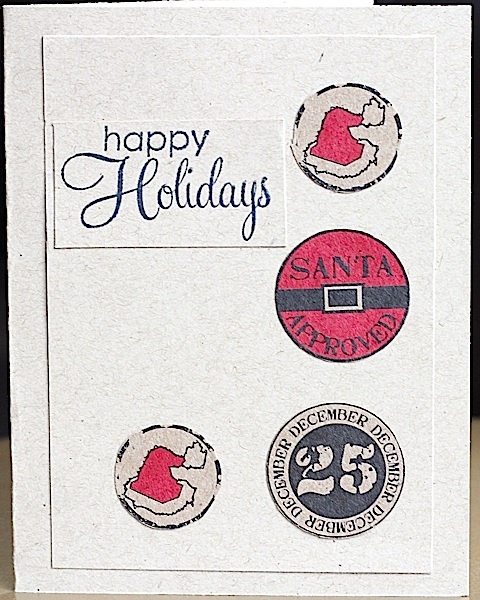 Stamp sentiment on kraft card stock, trim to desired size and adhere to card front. 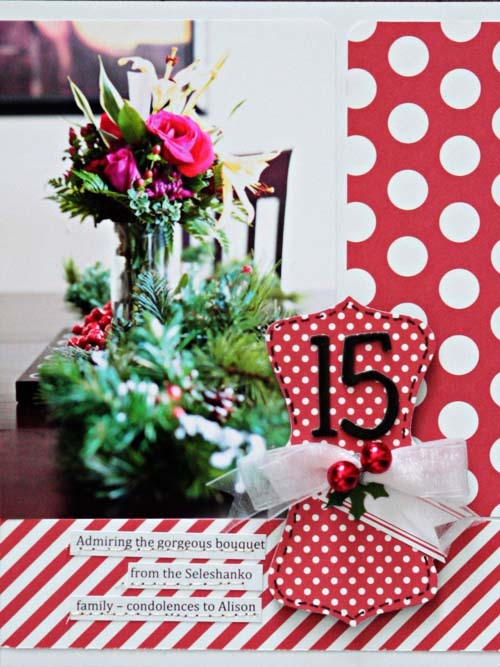 Adhere card front to kraft card base and add the Happy Holidays sentiment." Don't you agree that this is a wonderful card? 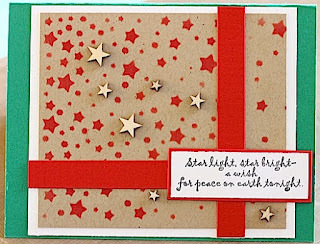 It's beautiful and easy to make - I can hardly wait to make some of these cards. As promised, we have some wonderful Christmas inspiration for you, our readers! 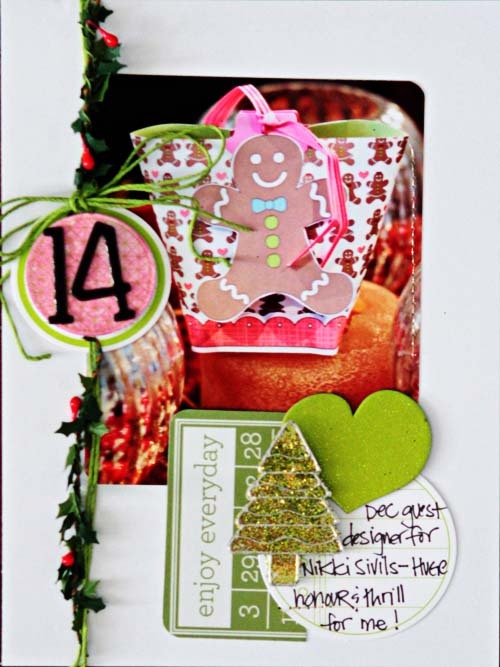 Be inspired by Rosie Neustaedter's card (shown below) using Elizabeth Craft Designs and Dee's Distinctively Dies Wreath Builder die. 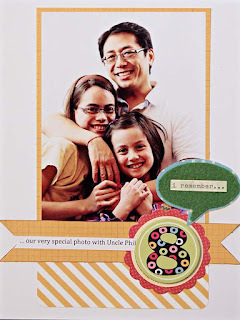 "This is a super easy card to make. I adhered a 6x6 double-sided sheet of adhesive to green cardstock then die cut the leaves using the Dee's Distinctively Dies Wreath Builder die. I peeled off the adhesive backing and applied Glitter Ritz transparent glitter in warm highlights. Layer leaves as desired using glue and pop dots, tie May Arts string burlap around top. 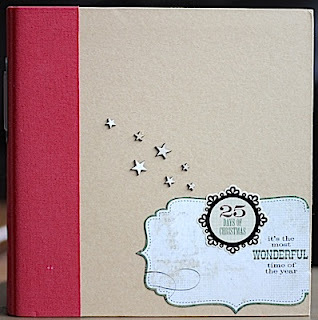 Either stamp or rub on sentiment on cardstock, trim to size and adhere with pop dots. The sentiment is stamped with Tim Holtz Festive Berries distress ink. Don't you just love that sparkly, Merry Christmas?" I think you will agree that these cards are absolutely stunning. As you can see, they take minutes to make and yield beautiful results. Are you feeling inspired? I know I sure am - thank you Rosie! We are so fortunate to have Rosie Neustaedter sharing her delightful December Daily with us this month. 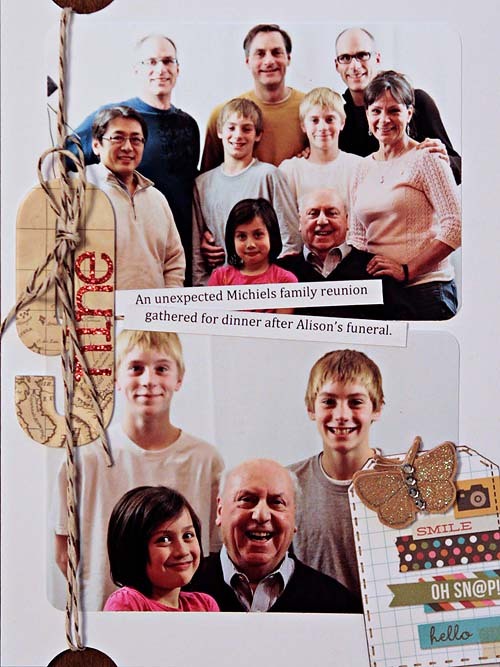 "The album and foundation pages are Simple Stories. I have used bits and pieces from my stash, products from Studio Calico, Echo Park, Little Yellow Bicycle, October Afternoon to embellish the completed pages. I keep all the items in a large ziplock bag and Iris container so I don't have to search through my stash to find the Christmas items. At the end of the day I upload my photos for the day on my computer and then print one photo. If I know I do not have a photo for the day I will have set aside a piece of memorabilia or choose a topic to journal about for the day. If I have time that evening I will attach the photo to the page and embellish otherwise I do it first thing the next day and then photograph the completed day. 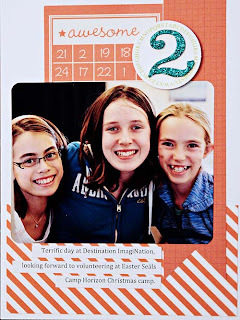 If you do not print at home you can save your photo(s) for the day in a folder marked "December Daily 2012" and then send to print all at once. What helps me keep up is not stressing about creating a perfect page, I am focusing on preserving the memory not producing a creative masterpiece and that attitude really takes the pressure off." 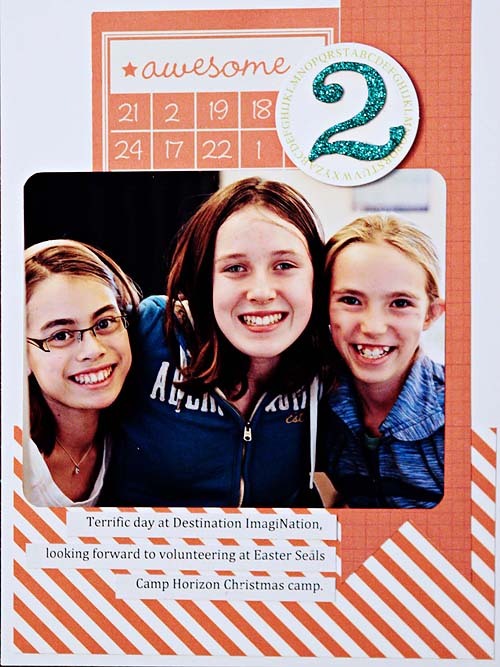 Thank you Rosie - we look forward to seeing the rest of your December Daily! If any of you loyal readers wish to share your December Daily with me, please let me know. I look forward to showcasing your work too! Welcome, welcome, welcome to December! Can you believe it is December? 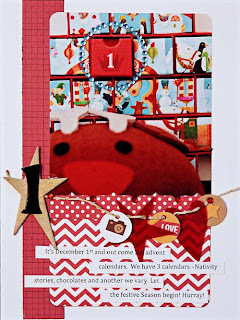 I know I can't but one of my traditions has been to create a December Daily. It has become one of my favorite albums and I along with my family adore pouring over the albums every December. 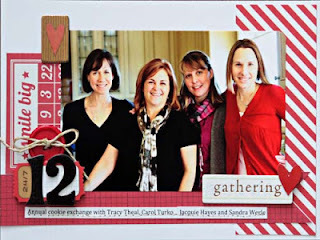 A word about how I approached my December Daily...my December Daily is a celebration of our month as a family. It isn't about all things Christmassy and wintery - it is a reminder of how we spent the month of December as Christmas nears. There are some spectacular days and some not so great days...those memories are captured. And yes, there are some terrible photos but they remind of so much. So keeping with tradition, here are my first 3 pages of my December Daily! 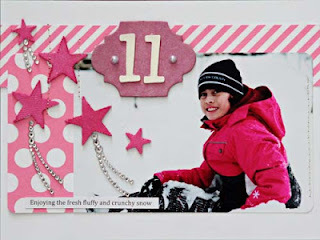 Before I show you the pages, I wanted to mention that December at Scrap Shotz on the blog will be one of inspiration. If we have inspired you in any way with our projects, please let us know!!! 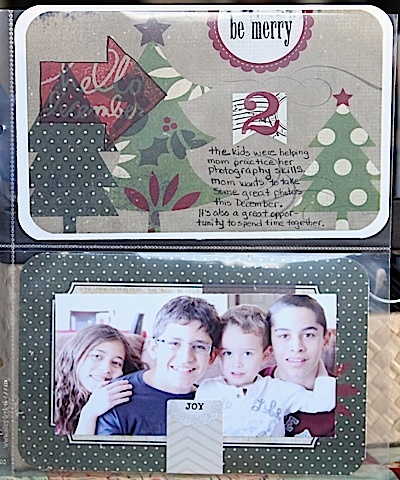 Without further adieu, here are the first 3 pages of my December Daily. My entire December Daily is created using the Simple Stories line - the pattern paper, the labels, the die cut stickers. 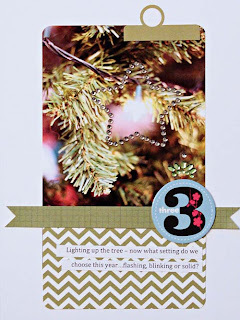 I augmented each page with left over American Craft thickers (numbers) and Urban Lily numbered chipboard circles...and what would my pages be without some bling, so there is lots of Prima, Kaisercraft, BasicGrey and Queen and Co gems and pearls!